Welcome to our Classic UFO Reports Corner. Here we will be presenting some of the UFO cases which are classic to Indiana as well as web sites which list classic reports nationally. I was a supervisor in a local factory when a fellow employee who was on break called me outside to look at something coming toward the plant from the northwest. Due to bright security lights we could not see the whole shape of what was a craft. What we did see was part of a circle with solid windows or openings in it. There was a red background light inside the craft. While we watched we could see several silhouetted figures moving about. One was looking over the craft edge and appeared to be looking in our direction. The window that the figure was looking down from was sloped out at the top and bottom forming a 'V' shape. Whatever it was, it was moving along at a leisurely pace of approximately 10 mph. and approx. 200 ft. to 300 ft. from the ground. I could see that as it floated along it did not have a smooth movement, but seemed to wobble on its axis. The vehicle was moving toward the southeast. All this took place after 8:00 p.m. It was dark outside and we were unable to determine the sized of the craft. I have kept this pretty much to myself over the years due to the jibbing that I had received for even mentioning it. I have always been a structured type of individual and tell things as they are. I have given approximate dates on the sighting as I had never written this event down. PS: The window that the figure was looking down from was sloped out at the top and bottom forming a V shape. similar to Barney Hill's graphic. During early March of 1987 many reports of unusual nocturnal lights and even some objects were being seen by citizens in Corydon, Indiana and other areas throughout Harrison County. 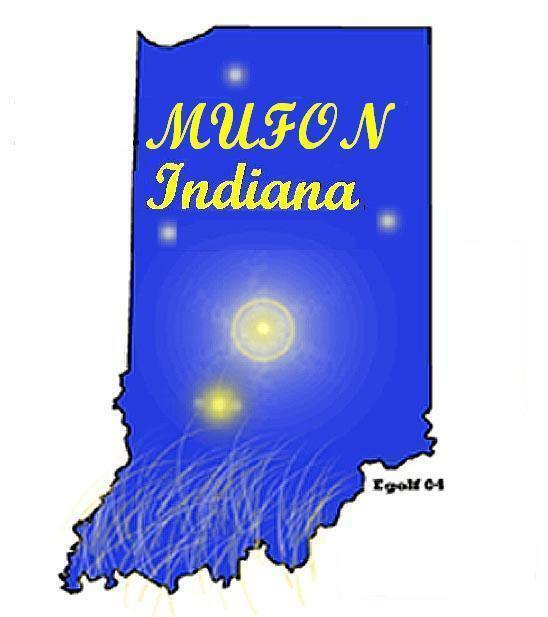 MUFON Indiana members investigated numerous reports, including a few in the neighboring counties of Floyd and Clark. This series outlines some of the most interesting and curious cases that were investigated. About the Witness: He served in the military 20 years, was a police officer (Elected County Sheriff) for four years and a corporate safety director for five years. He has lived in Europe and Asia, and fought in the Vietnam War for two years. I have flown on several different aircrafts and seen many things, but the phenomena I witnessed that morning on Aug. 2, 1996 was nothing I have ever experienced before. It all began when I received a doctor's appointment for my dad at the VA medical center in Indianapolis on Aug. 2, 1996 at 12:45 PM. I followed their directions on how to get there, as I have not been there for several years. I was traveling south on I-69 approaching the Fishers exit when I observed a dark grayish object about 1/4 mile to the west. I backed off the cruise to about 60 mph. I thought it was a blimp, like the ones that are sometimes tethered to businesses for promotions. I thought perhaps the wind might blow it side ways so I could read what it might say. That is when I noticed that it wasn't tethered at either end and it was lumpy and seemed to wobble. I then realized what it was doing. It was raising itself up vertically from a fixed horizontal position in the sky, (Like raising a dirty dime up from a table with a magnet) and leaving it balanced on top. Once it was on top it immediately began to glow white inside, (Like a dim light bulb becoming brighter for a fraction of a second and then dimmed again or pulsed). When it did this I could see inside and there was a dark grayish matter at the bottom (It was offset to the right of center). As soon as the whiteness was at its brightness, it moved to the left (South) in a perfectly straight line for about a 1000 feet. I thought it was going into a cloud to hide, but it didn't. It went in front of the cloud. That's when I could better judge its size and distance. It was approximately 250 feet in diameter. It was about 50 feet above the cloud ceiling, and approximately 1-1/2 to 2 miles west of my position. When it moved in front of a cloud I immediately noticed the left side of this perfectly circular object was disappearing (There was a slit or opening in the sky in front of the cloud). It continued into the opening until it completely disappeared into the cloud. While I observe this event I felt time slow way down, almost to a point that it stopped. It felt like driving into molasses and being hit with Novocain. I know this happened because I began to worry, (I have not worried like that since the last firefight I fought on football island in Vietnam in 1969). I began to worry because I could not turn my head, but I still had my peripheral vision. The Fishers overpass was still there and we were about to hit a column underneath it. That's when the object completely entered the opening and disappeared. Time then resumed to normal and I had control again. I said out loud "Hell lets do that again" and it didn't even wake my dad who slept through the whole 8 to 10 seconds of the event. I turned the radio on to hear the news, but nothing was reported, not even later on television evening news. The next day Aug. 3, 1996, I read an article in the Indianapolis Star Newspaper that the National Weather Services Doppler Radar Station at Indianapolis had detected unusual rings on their screens the previous day. They reported to the news media that they didn't know what would cause such a phenomena, but they did received two reports of birds taking flight all at the same time together. 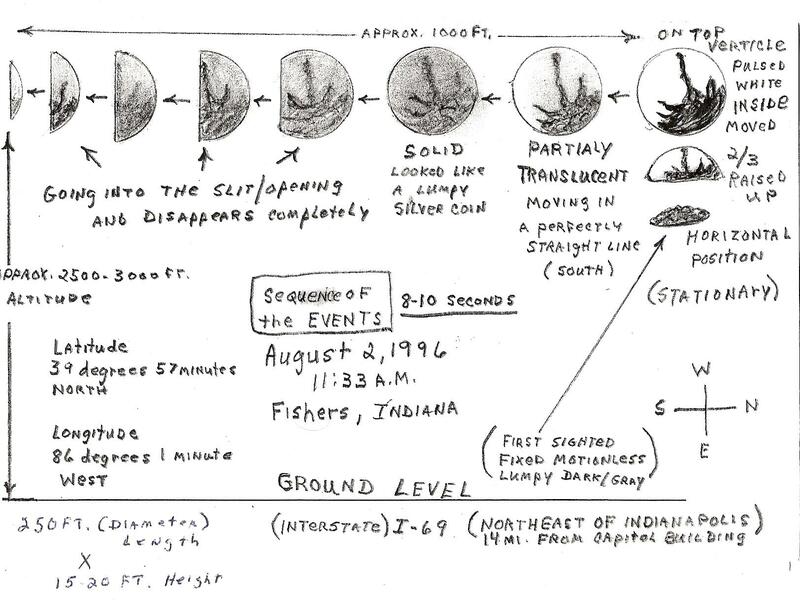 On Aug. 5, 1996 I called the NWS station at Indy and reported to two meteorologists what I had witnessed that morning. I answered their questions and we decided to meet and view the rings on the radar screen. When saw the rings I said " That's not birds", and the meteorologist stated " No their not, we know that now". I went home and never discussed the event again, except with a meteorologist at the North Webster Station. This station was constructed about a year later about 23 miles from my home. It's called NEXRAD for next generation Doppler radar because it is linked with all other Doppler's to one main office in one location. The reason I choose to speak about it is because I spoke with a gentleman who is a pilot and he told me about an event when he flew into an opening some 30 yrs. ago. We both believe that our events are directly related. We are only seeking scientific explanations. The one thing I do know is that it left its calling card! And the next time this pattern of rings first begins to develope we have about 3-1/2 hrs. Before the soft spot opens and it arrives and departs through the opening. I believe N.O.A.A. knows this and that's why hundreds of Doppler radars are viewed at the same time at one main location. Dr. J. Allen Hynek; Greene County Indiana 1980; Close Encounter of the Second Kind! At an unspecified time on the night of November 6, 1957 a potentially very important event occurred near Merom, Indiana (30 miles south of Terre Haute, on the Wabash River that bounds Indiana on the West). Rene Gilham, a 33 year-old ironworker was at his farm home when he noticed an unusual light. He went outside and saw that a brightly luminous object was hovering overhead. Gilham estimated its size as 40 feet in diameter, and its altitude as 1000 feet. From this object there "beamed out" a light that "bathed his farm with an eerie, penetrating light". He stood staring at this object for about ten minutes, during which time it was temporarily joined by a smaller object. Then the larger object departed, "went straight up and headed west". As it did so, the light became more intense, and it emitted "a whirring noise like a high-speed electric motor gaining revolutions". Gilham's wife and children, and his father-in-law in the adjacent house, also saw the object but did not watch it continuously. "The other members of the family verified the fact that the object was so bright that it lighted the entire surroundings". 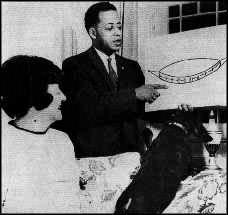 On the day after he had stared up at the UFO, Gilham's face began to itch and redden, and that night the "sunburn" was so painful that he went to a doctor on the of the 8th. The physician, Dr. Joseph Drake, found that Gilham's condition was not a rash such as might be caused by poison ivy or an allergy, but a real burn, "similar to the burns that are inflicted on the face and eyes when working near an arc welder without a face mask". Gilham said that he had not been near a welder for three weeks. The Merom, Indiana report is one of those that cried out for a full and thorough inquiry by competent investigators. Yet, to the best of my knowledge, this did not occur, either then or later. This is not a Blue Book case, nor am I aware of any investigation by civilian researchers. Does anyone know whether NICAP or APRO ever made any attempt to investigate this potentially important event? What a damn shame if they failed to pursue this matter! All we have are some newspaper articles that demanded follow-up. Something very interesting apparently occurred that night in Indiana, but apparent failure to conduct an all-out inquiry has ensured that what it was will never be known with any certainty. Hopefully insightful commentary by anyone would be appreciated. Seeing this case in the Ohio UFO Notebook brought back memories. A friend and I both called the Sherman hospital in Sullivan, Indiana as part of a NICAP investigation of the Rene Gilham case. We were told by the hospital representative we talk to that patient records were not public property and that they had a small fire in the records room and that the records were not available. Years later, after the fact, we learned that an Air Force officer had been sent to investigate this case for Project Blue Book. We later met this officer on an unrelated case in Illinois. So we were never really able to follow up on this case.